There has been a mistake. We were only playing, a half-daring dabble in the occult – but something has gone wrong. A malevolent spirit, trespassing in a world where it doesn’t belong. We who summoned it are possessed; and to banish it, one of us must die. Furtive Shambles is a nomadic game event focused on games with unusual ways of play, especially non-digital games. Each event focuses on a theme – the digital, the accursed, the coast – and a mixtape of small games is built around it. Each is also set in a different location, one that is ideal for the theme and the games. In Epping Forest we constructed a set of games that could be played in dark woods. We hunted a mustang, played a live version of Waldschattenspeil and told stories around a fire. 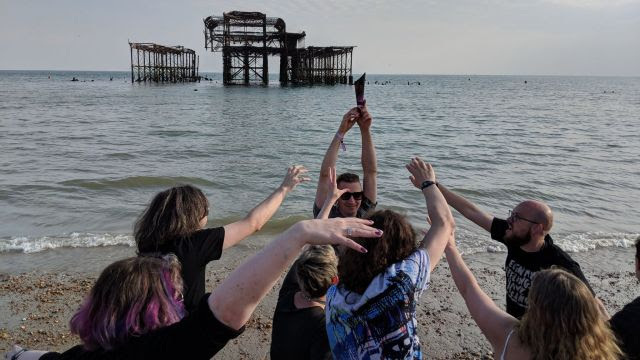 On Brighton Beach, we dove for lost treasures, played as the parts of a crumbling ship stuck on shore and pretended to be seagulls, swooping for ice cream. The event is run by myself and Thryn Henderson. We maintain a newsletter, where you can read more about the games, including advice on how to run your own events.